The term “First Gen” has become both a compassionate term of endearment and a resounding validation of experience. First Gen refers to First Generation – being the first in the family become a naturally born citizen in the United States. In my office, it also means First generation to take A.P. classes in high school, go to college, and/or become a professional. The experience of First Gens is a unique one that many can’t relate to which can leave First Gens feeling alone, misunderstood, with an incredible pressure to succeed in every life domain, and an underlying fear of being an imposter through it all. Today, I’m focusing on the themes that have come up in my First Gen therapy sessions, clinical supervision, and heart-to-hearts with the comadres and how compassion heals. I take a radically open approach that incorporates acceptance and self-compassion. In my opinion, these are the hardest skills and concepts to continually practice, and yet, they’re the best ones for ultimate healing. 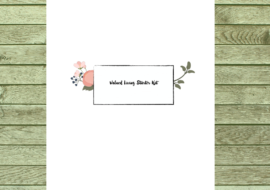 The concept of the to-say list came from my First Gen clients. First Gen Professionals love them their To-Do lists. It’s what got them through high school AP classes, college and thriving in their professions. I #jokenotjoke that Self-Compassion and Acceptance skills need to be permanent items on the Daily To-Do list, and to add a dramatic flare, in the morning, noon, and night rows! Acceptance as a skill is super important because one is accepting reality (whether current or in the past) as it is, “tal y como es.” This might mean accepting the emotion or struggle you’re experiencing. Acceptance helps in reducing our suffering because once we accept and let go of the struggle, we remove the internal tension and effort it takes to deny, avoid, or fight against it. Self-compassion is the right hand to Acceptance in that, when used, it will save the day in a way that provides genuine self-comfort and validation. It should not be confused with praise or affirmations stating you’re “Amazing and gorgeous, strong beyond measure who can rock any hurdle that comes along.” It is a genuine effort to remind yourself of everything you’ve been through while taking it easy on yourself. It’s acknowledging that what’s hard is hard and you’re worthy of love and healing. 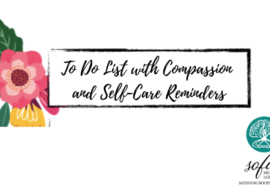 I tell my clients that self-compassion is like giving yourself the same gentle care that you would to a hurt child, kitty or puppy who is scared, hurt and tattered. You would likely (if you’re a child or animal lover) clean the injuries up very gently, speak in a kind and low tone, and walk them through exactly what’s going to help heal them (putting this medication/ bandaid on you, taking you to the doctor, I know it hurts. I know you’re scared. Let’s feed you some food and help heal you). 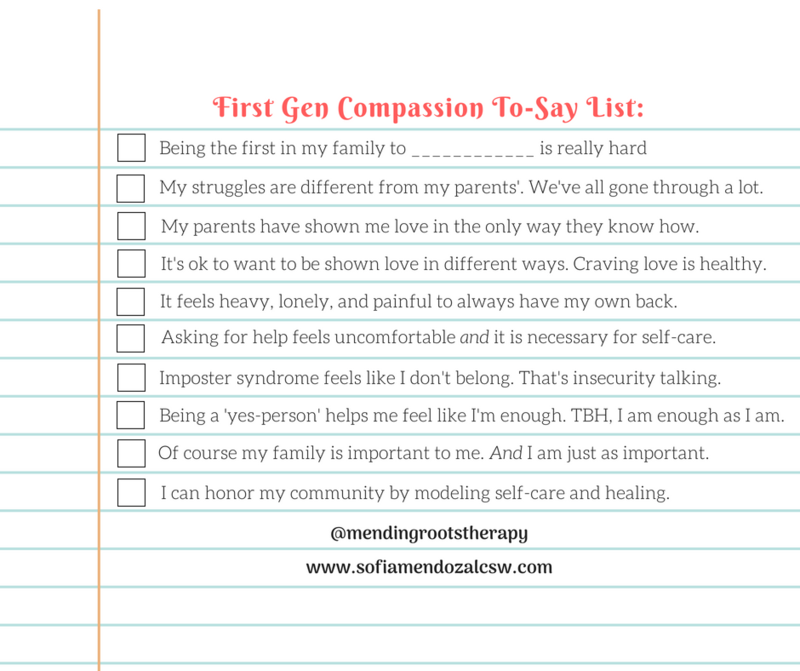 Check out the First Gen Compassion To-Say List below and see if any resonate or are useful to you. I started with a validation statement. Threw our parents’ struggle in there, along with a little something on Love Languages. There’s a nod to the other side of “being independent” and asking for help. Imposter syndrome also makes an appearance, along with helping behavior being a compensatory strategy, and being enough exactly how you are. And it ends with self-care and healing as an individual and also as a community.